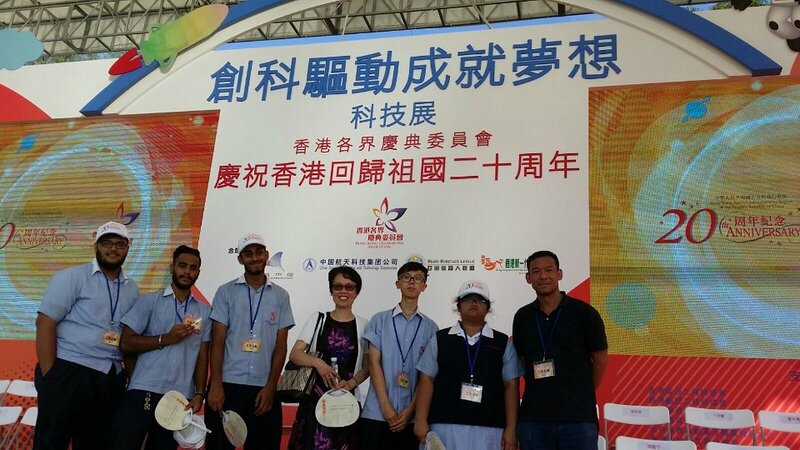 As part of the celebration program of the 20th Anniversary of the Handover, the New Generation Inno Expo 2017 was held in Victoria Park from 28 June to 2 July 2017 to showcase Hong Kong youngsters’ inventions and discoveries. Our school had the honour to be there to display our students’ innovative scientific and technological works. Our exhibits were highly welcomed and appreciated by visitors. Only 8 universities and 20 schools across Hong Kong were finally selected to take part in the Expo and their booths filled up a football field. It was an excellent melting pot for people there to give and take new techno-ideas. Techno-fans and citizens were all fascinated by the extraordinary displays from various units. It was no doubt an eye-opening ground for our students and any participants. During the whole course, our student helpers were passionate about the preparation of displays and gave detailed presentations to visitors to our booth. Despite the extremely hot and harsh rainy weather of the whole exhibition week, our students conscientiously carried out their duties early in the morning till late in the evening and left every single visitor a good memory of our booth and school. Our School Principal Mrs. Yeung and tutors, Mr. Tse and I, highly appreciated the attitude and effort of our students. With their help, our exhibition was made a tremendous success.